Our new app Disco Timer is an universal countdown clock for timing any task at hand – from boiling an egg to giving a presentation. It’s a small app with the big dreams of bringing a little more joy into your daily activities. We have put a lot of effort into making the app lively by carefully crafting the sound effects and spicing it up with some fancy animations. Therefore – Disco style! Setting the timer duration is based on 60-minute circle of traditional analog watches – you just wind it up with a single rotary gesture. Then tap the display to run, pause, or reset the timer. Large, high-contrast representation of the remaining time makes it glanceable from a distance. And an option to disable the Auto-Lock can keep the device awake while the timer is running. This comes in very handy when keeping an eye on the progress is as important as the finishing time itself. The face of the timer can be customized by choosing from a variety of color combinations (a Premium feature). And for the completion alert – you can select from a dozen great-sounding tones, all of which are crafted exclusively for Codulis apps. Give Disco Timer a try, and let us know what you think! First things first, the app is refreshed for iOS 7. I’ll be quick to assure that there is no shock awaiting you – Blood Pressure app retains its “skeuomorphic” design. Only small visual enhancements and necessary fixes were applied to the main screen. What has changed is how animations work and also all the places where standard iOS controls are integrated into user interface. So you will only start noticing changes when adding new measurements or managing your profiles, tags and filters in the settings level screens. User interface got a lot cleaner in there and I’m very happy with what iOS 7 brought in this regard. Another big feature that went into 1.5 is support for accessibility. Blood Pressure app is now accessible to visually impaired people through VoiceOver interface. That was definitely a good learning exercise on underpinnings of Apple’s accessibility technology, and more importantly, on it’s user facing side. Lastly, a short note on support for older iOS versions. The 1.5 is still iOS 5 compatible, and that’s mainly because I decided that I need to sneak in the VoiceOver support for older devices – as you may know Apple started allowing you to download the older-device–compatible versions of apps. But at the same time, this new App Store feature is the reason why the plan going forward is to be far more aggressive in requiring the newest and greatest iOS version. That’s it for now, enjoy the update and take care! As you can see, design is clearly built around the iPad size factor, but – although I didn’t shoot for a responsive design at this point – it’s quite comfortable on iPhone screens too. Also, there are now two new types of news feeds available: Codulis newsletter and Facebook page. Newsletter – look for the button in the footer of the website to subscribe to it – is dedicated for bigger announcements only, meaning releases of new apps or major versions of them. If more fine-grained bits of news are what you prefer – Twitter, Facebook or blog’s RSS feed may serve you better. Your comments on the new design, as always, are very welcome. And if you’ll notice some problems with the new website on a browser I didn’t have a chance to test on, please let me know. Thanks in advance. Meanwhile, I’m jumping back to the drawing board to play with the new and exciting stuff in iOS 7 beta and my new app ideas. If you are sticking with an earlier-generation device for now, the changes in 1.4 will be quite subtle: there are some UI tweaks here and there, color scheme changed a little, also the app icon got a slight refresh. One more thing to notice: the app starts requiring iOS 5 or later. And that means iPhone 3G and iPod touch 2nd generation and earlier are not supported anymore. Anyway, I hope you will like this new version. Update and enjoy! One more new thing in 1.3 release of Blood Pressure app is a Lite version. It was hanging in Apple’s review queue a bit longer, so I didn’t mention it in previous post. But starting today, Lite version becomes available on the App Store as a free download. Feature-wise, the Lite version is identical to the full version of Blood Pressure. 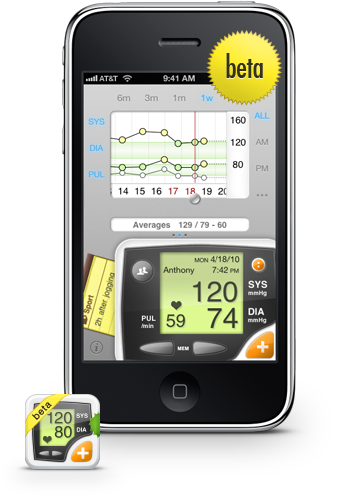 The only difference is the limit on storage: free version allows to save only 10 blood pressure records per person. After reaching the limit, one may buy the full version of an app and effortlessly migrate all the data collected in Lite version. I hope now – with “financial risk” removed from the equation – a lot more people will be willing to give the app a try. And that’s a win-win for both sides: potential customers and my indie business. Today I’m releasing the 1.3 version of the Blood Pressure app. This probably could be called the maintenance kind of release and it’s mainly about the full support for multitasking. On newer devices the updated app now opens a lot faster most of the time. And from perspective of users with older devices (without real multitasking support) – most notable part is full state saving. App was preserving the state of the main screen before, but now every mode of every screen is covered by saving/restoration process, so you return exactly where you left, every time. The 1.2 version of the Blood Pressure app brings Retina graphics to the table. If you use iPhone 4, 4S or the latest generation of iPod touch, that will be a really nice boost in visual quality. The update also includes a lot of little tweaks to account for the changes in the underpinnings of the user interface layer of iOS 5. Update and enjoy the new crisp graphics! About 90% of support email I was getting were requests for the ability to export data from Blood Pressure app. 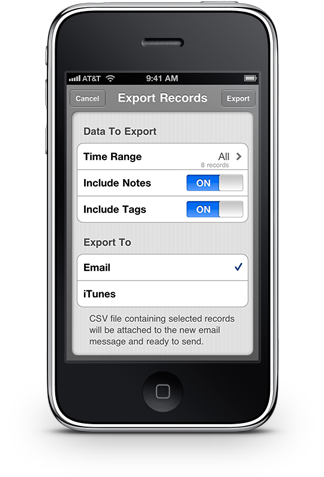 So here comes version 1.1 with a spreadsheet file (CSV format) being the first option for exporting your records. The update has already been approved and is available on the App Store right now. Export functionality is accessible from person’s profile screen in settings. 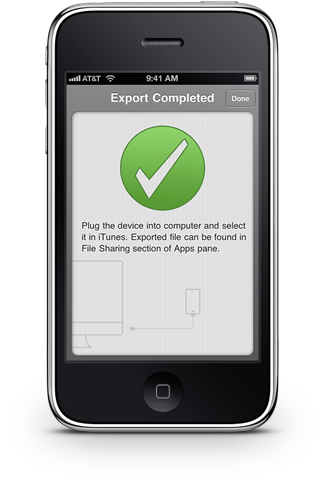 When you tap the Export Records button – options screen shown below is presented to you. As you can see, there is ability to choose relevant time period, to include or skip notes and tags in exported file, and there are two approaches for getting CSV file out: email and iTunes File Sharing. If you choose to export to iTunes, you will need to connect your device to computer using USB cord afterwards, select the device in iTunes sidebar and then navigate to Apps > File Sharing. You will find Blood Pressure app listed there and you will be able to copy your just exported spreadsheet to your computer. There you have it. Double click the exported CSV file to open it in Numbers or Excel. I'm glad to announce that Blood Pressure app has successfully gone through Apple’s review process and is now available on the App Store for a launch price of just 1 US dollar. If you do, at least sometimes, measure your blood pressure and your measuring device does not have any graphing capabilities, you definitely should give this app a try. I hope you’ll find it very useful. Also, your feedback would be highly appreciated – if you have any comments or suggestions, just drop me an email. Hello and welcome to the blog! Chances are high that you are hearing first time about Codulis. So, what is this all about? In short, the mission is to build top quality apps with interesting user interfaces that are joy to use. Visual design, usability and overall user experience are the top priority – mainly because I just love doing this stuff so much! I’m about to release my first iPhone app, which – as you are probably already guessing from the title of the blog post – belongs to medical category. It’s a “diary” for tracking blood pressure measurements taken at home using your regular blood pressure monitor. After months of working on details, polishing and tuning, Blood Pressure app is almost ready to ship. And “almost” means you now have a chance to get hands on the beta version. You have basic experience in iPhone app testing, meaning you know what UDID is and how to install Ad Hoc distributions of apps. You have a device with 3.1 or later version of iPhone OS installed. You have basic understanding of what blood pressure tracking is about (if you keep eye on your blood pressure yourself, if you have tried similar apps or services – that would be great). So, if you’re interested in being a beta tester, drop me an email. Mention what kind of device you own, leave its UDID number and give a sentence about what motivates you to participate.